On July 3, the Federal Energy Regulatory Commission (FERC) authorized Phase I of the Sabal Trail pipeline to begin full operation. 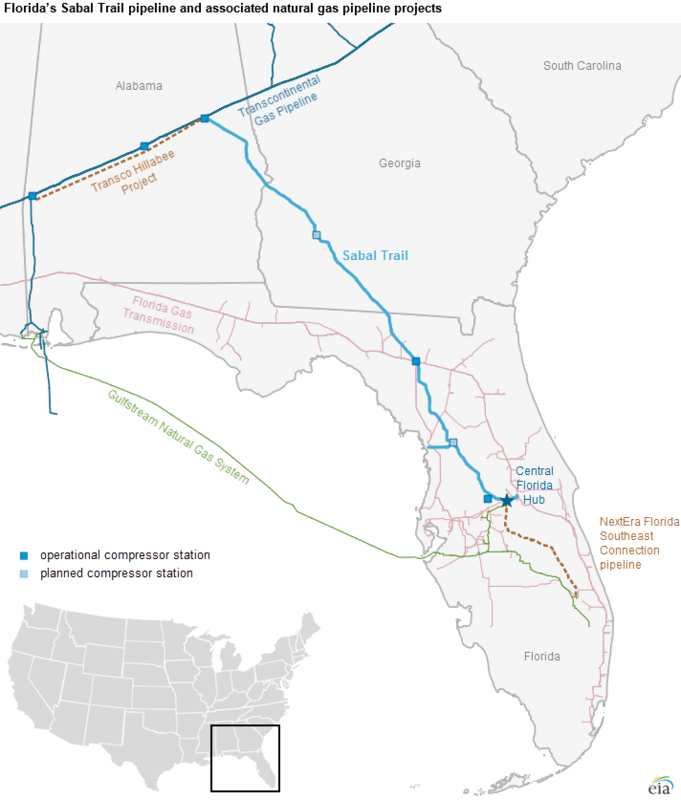 Sabal Trail is a 515-mile interstate natural gas pipeline transporting natural gas from an interconnection with the Transco pipeline in Tallapoosa County, Alabama, to the Central Florida Hub in Osceola County, Florida. Sabal Trail is one part of the Southeast Market Pipelines, three pipeline projects designed to increase natural gas transport capacity to Florida. Much of the additional natural gas expected to flow into Florida will be transported to its power plants. 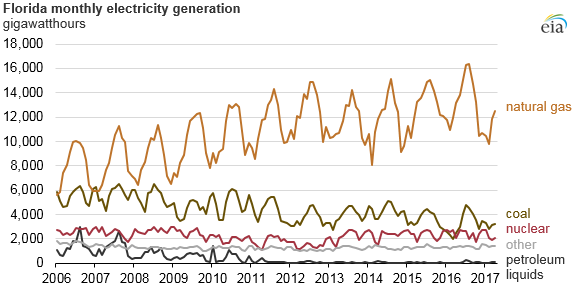 Since the beginning of 2016, Florida has added 3.4 gigawatts (GW) of natural gas-fired electricity generating capacity, which is more than any other state. Another 3.9 GW of natural gas-fired capacity is planned to come online in Florida over the next six years, based on data reported to EIA by project developers. Increases in Florida’s natural gas capacity have come as older coal- and oil-fired capacity has been retired. Unlike many states that have been building new natural gas generators, Florida is not located near a major source of natural gas production, and Florida’s geology is not conducive to underground natural gas storage. As a result, the natural gas needed to meet increasing demand is transported by pipeline. Sabal Trail Phase I is designed to have a total capacity of 810 million cubic feet per day (MMcf/d) and began partial service on June 14, with only two of three Phase I compressor stations operating. The next two phases will increase Sabal Trail’s total capacity to 1,050 MMcf/d. Phase II, when completed in 2020, will add 170 MMcf/d of capacity with the addition of two new compressor stations, and Phase III, scheduled for 2021, will add 70 MMcf/d of capacity through expansions to existing compressor stations. Two other projects associated with the Southeast Market Pipelines are Transco’s Hillabee Expansion Project and NextEra’s Florida Southeast Connection. Phase I of the Hillabee Expansion added 800 MMcf/d of capacity to the Transco line in Alabama to provide natural gas to Sabal Trail. Phases II and III of the Hillabee Expansion Project will add 200 MMcf/d and 100 MMcf/d of capacity, respectively, in 2020 and 2021. 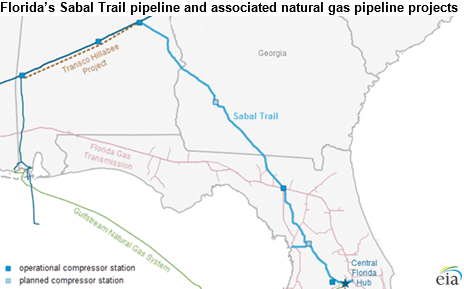 The Florida Southeast Connection receives natural gas from Sabal Trail at the new Central Florida Hub, where Sabal Trail also connects with the other major pipelines in central Florida in order to increase regional natural gas deliverability. Florida Southeast Connection has the capacity to transport 640 MMcf/d of natural gas to Indiantown in southern Florida. The Southeast Market Pipelines represent the third major pipeline network delivering natural gas to central Florida. The first network, Florida Gas Transmission, was put in service in 1959 and has been expanded many times since then. The Gulfstream Natural Gas System came into service in 2002. Sabal Trail connects with both of these pipeline systems at or near the Central Florida Hub. More information about natural gas pipeline projects in the United States is available in EIA’s database of pipeline projects.